My knitting friends are crocheting like crazy all of a sudden. Let’s blame Maryse, shall we? 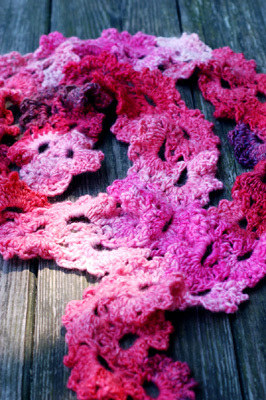 Not only does she crochet wonderful things, but she takes gorgeous photos of them and is happy to teach the poor knitters to crochet, as well. I’m thoroughly addicted, but maybe need to branch out and crochet a different pattern next time. Oh, well, he’s another Anne scarf, without mistakes this time! Pattern: Anne, by MK Carroll. Ravel It. Yarn: My handspun and hand-dyed worsted weight singles yarn. Corriedale, 3.55 oz., 212 yards. It’s the one on the right. I spun a singles yarn from the end of an un-split combed top for long color repeats in the finished scarf. I love it! 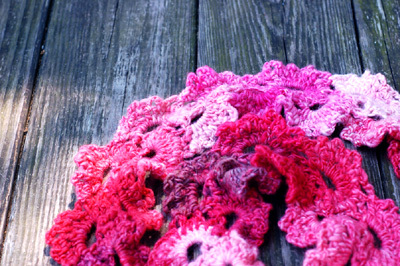 Check out Cheryl from yarnbee’s awesome example. She Navajo plied her yarn for a long color repeat. Here’s the other one I made a little while ago, complete with “elbow” where I forgot to turn the scarf. Oops! Later on today I’m going to add some nostes and handspun from Maisy Day Handspun to the shop and I’ll be back later today or maybe day after tomorrow with some fantastic summer salad recipes I’ve been making like crazy for the past couple of weeks. They’re saving our lives in this heat! It’s definitely viral. Back when you made your other Anne, I was trying out some crochet. Seeing your beautiful work sealed the deal! Is this scarf blocked? I really like the texture. 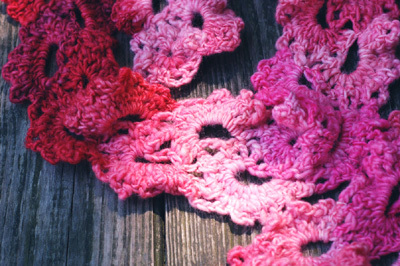 it is fun to crochet but just so much harder to keepÂ´tension. so crochet patterns make lovely prime rib effects and can be mated with knitting to make some mighty nice garments. your annes are pretty and reminds me of some very expensive french scarves they sell here. wish i could remember the name. great inspiration. i will have to think. It’s so lovely! Love love love the colors. I’ve been teaching a few knitters to crochet lately, and they COULD NOT hold the yarn in their left hand… so for the first time ever, I taught someone to crochet while “throwing” the yarn over the hook. lol.. whatever works! Lovely work and I love the colorway! 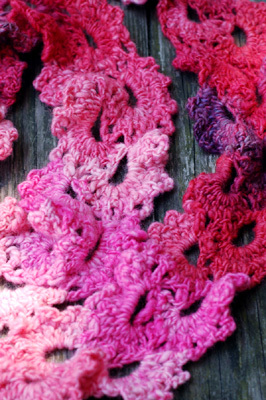 It’s great to see the crochet revival, especially as embellishments to knitting; I started knitting when I was 9 and only figured out knitting a few years ago (am now a confirmed knitaholic), so it’s noce to see that I was on to something all along!